Screenshot of Golem. 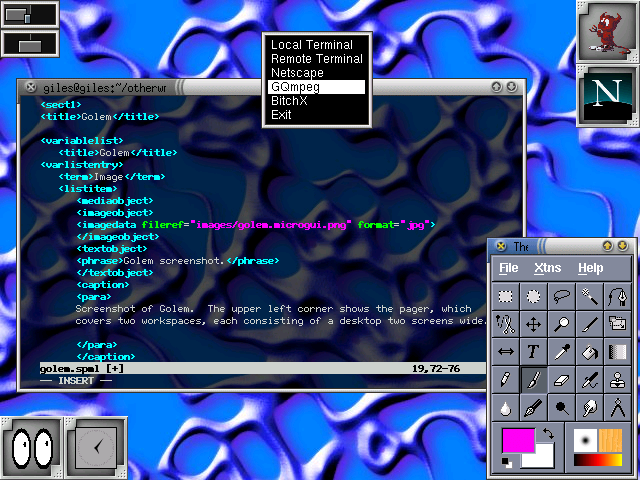 The upper left corner shows the pager, which covers two workspaces, each consisting of a desktop two screens wide. The upper right shows program launchers in a dock-like arrangement, and the lower left shows xeyes and xclock docked. Over the terminal is the default menu (which is pulled up with a right-click on the desktop). I used version 0.0.5 from April 2002. This was the most recent version in September 2003. What there is is quite good, but it's wholly inadequate. Golem is (or was?) a very ambitious project. It's very themeable, it supports dock apps, it has a launcher, a menu system, virtual desktops and workspaces ... But no new version since April 2002 and some problems with the existing version. Mostly, the documentation is inadequate. I would be sorely tempted to say "this is one to watch" except that development appears to have ceased. Too bad. There was some development and theme activity, but this seems to have died away.